Bolton then proceeded to give an update of the progression of spaces on campus that are inclusive for people of all gender identities and gender expressions. “Last year and this year, the residential life team has been working with students to ensure that restroom spaces in all residence halls serve all students well, starting with the upper-class halls,” read the email. Another recent effort to create more all-gender spaces is the addition of an all-gender locker room in the Scot Center. “Student affairs, facilities management and athletics have worked together to identify space for, and construct, a temporary all-gender locker room on the second floor of the PEC, just outside of Timken Gymnasium. This is a private, single-person facility, which includes a shower, sink, toilet, lockers and bench. A permanent all-gender locker room will be constructed as a part of phase two of the PEC/Scot Center renovation, to be completed next year,” said Bolton in her email. “The all-gender locker room space was announced by Dean of Students Scott Brown earlier this semester at SGI’s [Sexuality and Gender Inclusion] Queering Campus Climate event (a part of the Gender and SexualiTea series),” Myra Praml ’19 said. Praml is the gender and sexuality diversity representative of CC. “I think that it represents the increasing visibility of queer and gender non-conforming folks on our campus, and the growing valuation of queer voices. The temporary all-gender locker room and the plans for the construction of a permanent all-gender space demonstrate the constant necessity for efforts to be directed at making the College a welcoming and safe place for all who call it home,” said Praml. Beckett and Reid explained that collaborative work will be emphasized in order to address facility needs related to all-gender usage and inclusivity. “As an intermediate step between the two phases, the College has just transformed the previous women’s restroom on the main PEC concourse from a single space to two functional spaces. 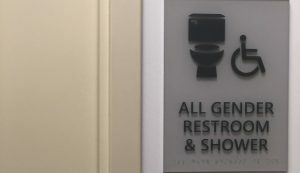 We now have an all-gender space equipped with a restroom, shower, lockers and changing area as well as a separate women’s restroom,” Beckett and Reid added.